dr. Nanna Hilton joins the Young Academy! We’re so proud that our own dr. Nanna Hilton is one of the ten scientists who are joining the Young Academy of the Royal Netherlands Academy of Arts and Sciences as of March 2019! She already was part of the Young Academy Groningen, but as of 2019 she will join the national team as well. In 2019, ten talented researchers from various disciplines will join the The Young Academy of the Royal Netherlands Academy of Arts and Sciences (KNAW) . The Academy organizes activities in the field of science and society, interdisciplinarity and academic policy. 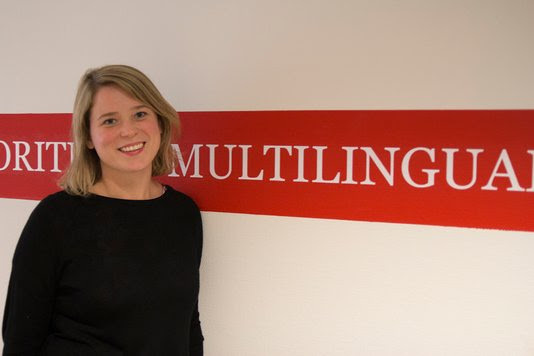 Two of the ten latest additions to the team come from the University of Groningen: linguist Nanna Hilton and neuroscientist Marie-José van Tol. Nanna Hilton is part of the Faculty of Arts and specializes in sociolinguistics. In her research, she actively involves the public, by conducting research together with non-researchers and using modern technology such as apps. Furthermore, she presents the UG podcast In de wetenschap and is working on two MOOCs. And of course: she teaches in our programmes! Nanna helped to devise our Bachelor’s degree programme in Minorities & Multilingualism, and was part of the small team that set up our Master’s programme in Multilingualism. On joining The Young Academy, Nanna intends to continue promoting citizen science projects in line with her research. Good luck Nanna!